I am so behind in posting about Break of Dawn nearby. 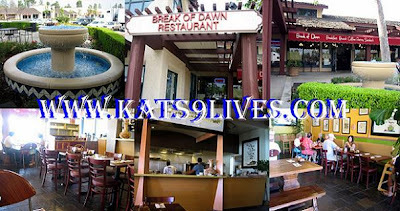 They are a popular breakfast place tucked away behind the Laguna Hills Mall. Despite the location people are still able to find it. The first time I went to this place was with Tofu while he still lived in California. We all miss Tofu! Mango really wants him to move back. They have a simple decor/setup here. Most are wooden tables and it's quaint. The people are friendly and I am sure if you go often it would be a place where they know your name. I read somewhere that the chef here is from the Ritz Carlton. He decided to leave and start his own business with a different take on breakfast. On my first visit I was exhausted and needed a pick me up so I decided to get their Vietnamese Iced Coffee. I was astonished about how small the drink is. 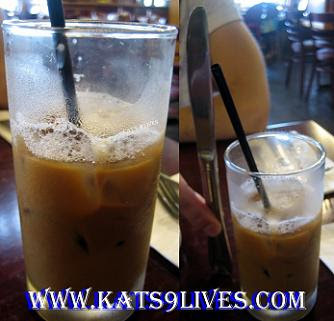 We held up the knife to show the real height of the drink. For $3.50 it is pretty pricey, albeit a strong drink. I can get this easily for less and get more for the value, so I wouldn't order this again. Since this was my first visit I ordered a lot of things to try out. For the appetizer I chose Shrimp Egg Rolls because they sounded delectable. I wasn't too impressed as it was filled with a bunch of random ingredients. There were a lot of different vegetables and noodles inside that didn't compliment the shrimp or flavor well. Tofu got Waffles for his dish, but it was not anything special. He would rather go to the Original Pancake House for his waffles. I think he wanted a traditional breakfast and I don't really think that this place is suited for that. If you want to come here, you should really try some of their more unique dishes. They really aren't breakfast breakfast because it is a lot heavier than what people normally eat. He ordered a side order of their Sausage. Ironically he didn't really like it because it was not the type he thought it would be and I really enjoyed it. I bet he was hoping for an Italian sausage but this was an Asian sausage. It was sweet and savory at the same time. Tofu was probably not use to it and he just wanted a salty yet spicy breakfast sausage. Even though I really liked the sausage, I don't know if I can bring myself to pay $4-$5 for just one piece of sausage cut in half. I wished they had the option of a bigger order for a better price. For my dish, I chose something more unique. After looking over the entire menu, I decided to get the BBQ Pork because it had one of the most unique components. It is a pulled pork with a Jalapeño Corn Cake, Tropical Slaw, and Tempura Egg. The pork was very nicely flavored and tender. I thought the corn cake was more like overdone hush puppies. It didn't work with the whole ensemble. The slaw helped balance and enhance the pork. Normally I don't really like eggs but I was really tempted to try out Tempura Eggs! I was astonished to see that the egg was still runny and moist inside. The outer texture was very crunchy and a nice contrast to the inside. It was worth the try and I ordered it again when Ms. Lin was around to show her this unique way of cooking eggs. I am always up for trying new innovative ways of cooking. To end the meal, I wanted to try the Mini Coconut-Chocolate Crème Brûlée. I thought the price being $3, why not. It's really small. At first I was sad about the size but then I took a bite... uh no thanks. I wasn't a big fan of the flavor. Normally I love crème brûlée but I don't know if the combo of coconut and chocolate really work well together. The one good thing is that since it is so small the surface area for burnt sugar is much greater.